For a wine and food lovers (like me), California Wine Country is a great getaway to enjoy fine wine, unique eats and beautiful weather. Ideal for a girls' trip, or a romantic weekend for two, Napa is the perfect place to escape to. These are just a few of our favorite places that should be added to any Napa itinerary. 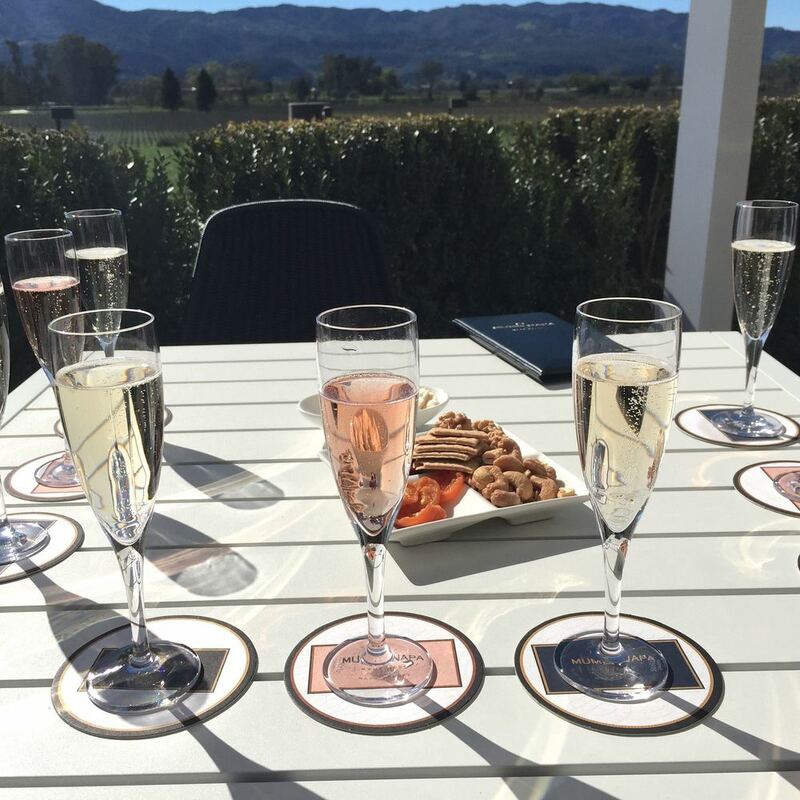 Breathtaking views, sparkling wines and attentive service all made Mumms one of our favorite stops. The large covered terrace looked out over the vineyards, with the Mayacamas Mountains in the distance serving as a perfect background. Our server was knowledgeable about the champagne varietals and the presentation of our tasting was lovely and informative. There were multiple flights and various prices to choose from, and we also enjoyed a small cheese plate to nibble on between tastings. Welcoming, friendly and quirky are the best words to describe our experience at Mark Herald Wines. Located right next to the Oxbow Public Market in Downtown Napa, this tasting room had a great atmosphere that wasn't too formal - perfect for a relaxing evening. The two gentlemen behind the bar were great hosts, cracking jokes while sharing their deep knowledge of the wines and how to best experience each taste. We enjoyed the Sexual Chocolate wine pairing - six hand-crafted Belgian chocolates paired with six different wines. The chocolates paired excellent with the wines offered. Raymond Vineyards had the most character of the vineyards we visited. The large grounds included the Frenchie Winery for dogs - the perfect shady dog suite for your pet to relax in while you enjoy the wine inside (where you can even watch your best friend via their 'Frenchie Cam'). The gardens are filled with beautiful plants, fruits and vegetables (and even some animals). The large picture frames are perfect for capturing a photo of your experience, with the gardens and mountains serving as the perfect backdrop. Inside, the wine cellar has several uniquely styled rooms, and also offers two tasting rooms with different atmospheres and wines. One tasting room had a '50 Shades of Grey' feel, while the other was bright, sunny and bit more casual. The staff was accommodating and knowledgeable about the wines and the area - and even recommended which winery we should visit next! The Oxbow Public Market in Downtown Napa is the perfect place to find a diverse mixture of local food vendors, artisan cafes and organic produce from local farms. We stopped multiple times and enjoyed unique tacos at C Casa, authentic Italian pizza and wine at Ca' Momi (they are one of only four pizzerie in the Bay Area certified as Verace Pizza Napoletana), and homemade pastries, local coffee and fresh breakfast sandwiches at Model Bakery. The best way to get to and from in Wine Country is most definitely a limo! This stress-free option gives you the freedom to enjoy yourself (and maybe enjoy a glass or two of wine during the ride). John at Anthem Limo Service was a great chauffeur, arriving promptly on time, and sharing tips on the best wineries and restaurants to visit.